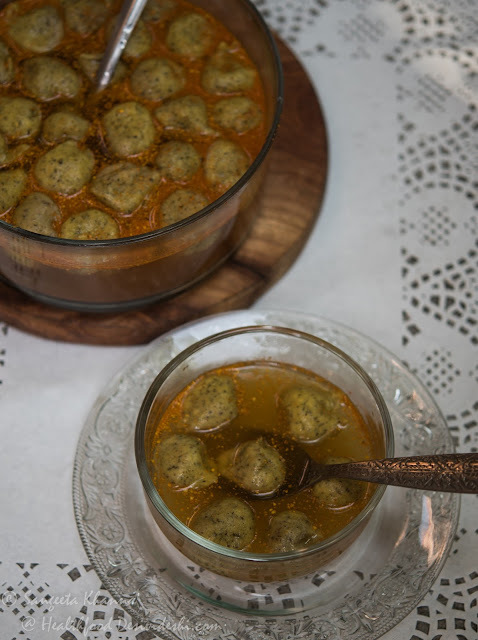 Kanji vada is a lentil dumpling soaked in fermented kanji. Ah and kanji is something you must know if you haven't come across yet. 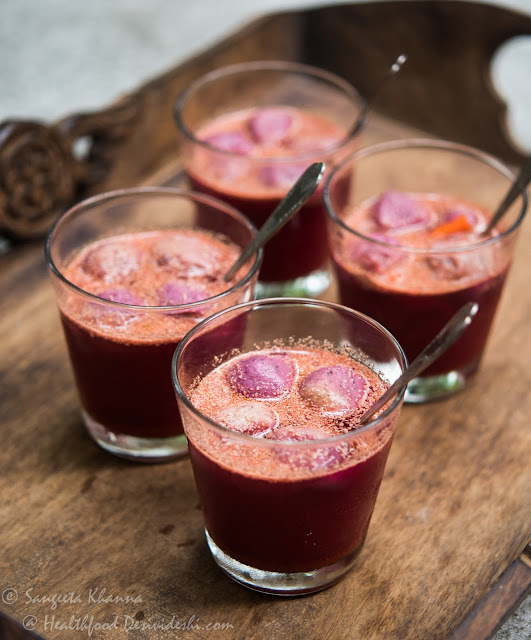 It is the most delicious probiotic drink generally made with black carrots during winters but can be made with summer carrots or even beetroots. For kanji vada the kanji was made even without carrots in older days and the kanji used to be pale but it packed extra punch because it had the kala namak and the hing in it, making it an absolutely lip curling drink and eat. In fact a few chaat walas used to make kanji wada on special request. The kanji vada was always kept in a ceramic barni because clear glass utensils were not so common in older days. Kanji vada is typically a Marwari tradition and since Banaras was initially populated by Marwaris and Gujratis we have had a flourishing tradition of papad, badiyan, achar and kanji vada apart from many more Marwari treats. I have had kanji vada in a Marwari friend's home and Arvind's mother used to make it too but I have heard more stories about how much kanji vada was loved and that it was part of the elaborate wedding rituals in punjabi khatri homes. Kanji vada or plain kanji was made during Holi too. I wonder how such simple foods made such fond memories for so many people. A few ingredients were used in so many different ways that food was never boring, every season brought new flavours even though the recipes were basic. There were a few fermented foods that were considered good for health and were intertwined with either religious or wedding rituals or festivals and that is how some of the recipes have survived. Kanji vada was always considered good for digestion and all the heavy eating during wedding was taken care of by this, at least that was what people said. Few people knew it was probiotic food too. Similar belief was bestowed upon kanji vada during Holi festivities. Mix all the ingredients for the kanji and keep it in a glass jar or ceramic barni, covered. This fermenting pot will be kept in a warm place so it starts getting sour after 2 days. Keep in sun if it is winter time. The day it starts getting sour, prepare for the vada. Soak the dal overnight, drain the soaking water and make a smooth paste, adding a little salt and water if needed. A mixie grinder works best for this but you can use any gadget to make urad dal paste that looks fluffy and smooth. Heat the oil and deep fry small fritters scooping the urad paste with a spoon and dropping it in hot oil. Fry till the vadas are cooked and dunk them straight into the souring (fermenting) kanji. Leave the kanji vadas for one more day so it gets nice and sour and soaks up liquid too. It keeps well for a couple of days at room temperature. Serve as required, chilled or at room temperature but remember to adjust seasoning before serving. The black carrot kanji or beetroot kanji also works great for soaking vadas. 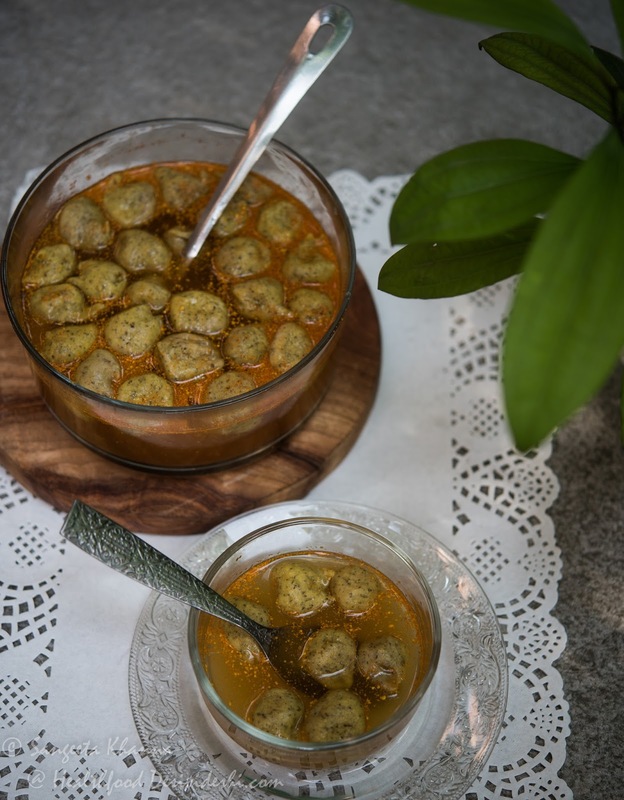 It makes a nice aperitif served before meals but can also be served as a snack. Make some kanji vada now and see how you like it. I have seen people taking second and third helping but for some people it can be an acquired taste. Fermented foods don't always make great first impressions but will stay with forever if you make friends with them. Kanji vada is one of those fermented foods to be friends with. Try that.